Concrete is one of the most versatile, durable, efficient, cost effective construction materials available. With a 2006 worldwide production rate of 9 billion cubic yards per year, it is used more than any other man-made material in the world. The U.S. alone uses about 340 million cubic yards of ready-mixed concrete each year. Since it is a perishable product ready mixed concrete production facilities are located in numerous metropolitan and rural locations and typically within 60 to 90 minutes traveling distance from any construction project. It is used in highways, streets, parking lots, parking garages, bridges, high-rise buildings, dams, homes, floors, sidewalks, driveways, and numerous other applications. 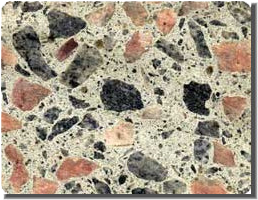 Vital to the concrete mix, creates a chemical reaction when it makes contact with cement. Solid or liquid chemicals that are added to ready mixed concrete before or during mixing. Added to improve durability, workability, setting time, and water content. Most important material in the mix. When combined with water it becomes the glue that holds everything together. Gives concrete its resistance and durability. Makes up 60 – 75% of concretes volume. Mined from quarries. Cement, Aggregates, Water and Additives are combined and mixed thoroughly to create a product that can be molded or shaped for various applications for all forms of construction. Concrete is transported to the jobsite while being continuously mixed at a speed of 2-6 rotations per minute.